-either what it is a phenomenon allocyclique: for example, the flint forms every time a climatic parameter is reached. What have just noticed we about flints can extend to other types of rocks or to a physical parameter. Mange and al. (1999) perfectly analyzed the series cénomanienne of the South of England which presents alternations chalk / marl on strong thicknesses. Robaszynki observes the following alternations in Cénomano-Turonien of the Course White-nose. 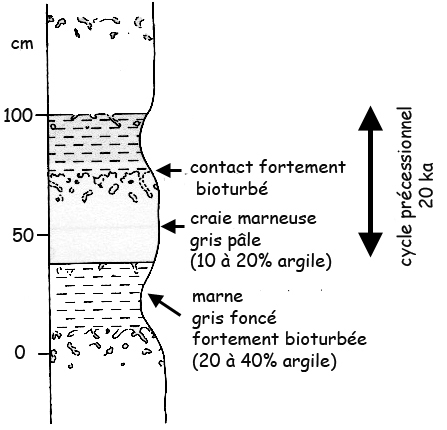 The porosity is a physical parameter measured in the drillings by logging. Gold, the low porosities are often bound to a presence more marked with clayey minerals. Logs diagraphiques in the chalk shows cyclic variations of the porosity. But other parameters: sonic, gamma ray, can be analyzed. Climatic precession: 22,4 + 18,6 ka (that is approximately 20 ka). Thus the elementary cycle would be a cycle précessionnel. But flints often group together by packages of 4 in 5 suggesting a modulation by a cycle of longer period (short eccentricity 100 ka).